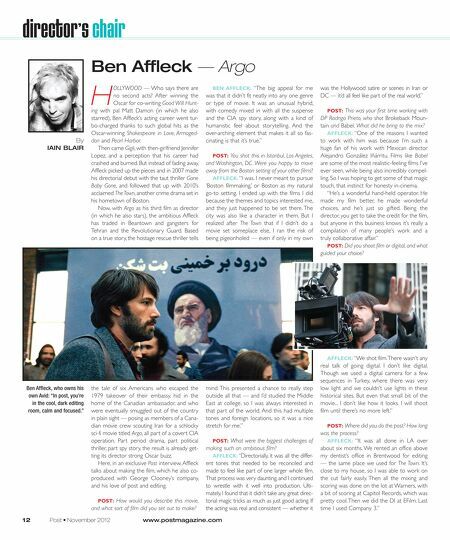 director's chair H By IAIN BLAIR Ben Affleck — Argo OLLYWOOD — Who says there are no second acts? After winning the Oscar for co-writing Good Will Hunt- ing with pal Matt Damon (in which he also starred), Ben Affleck's acting career went tur- bo-charged thanks to such global hits as the Oscar-winning Shakespeare in Love, Armaged- don and Pearl Harbor. Then came Gigli, with then-girlfriend Jennifer Lopez, and a perception that his career had crashed and burned. But instead of fading away, Affleck picked up the pieces and in 2007 made his directorial debut with the taut thriller Gone Baby Gone, and followed that up with 2010's acclaimed The Town, another crime drama set in his hometown of Boston. Now, with Argo as his third film as director (in which he also stars), the ambitious Affleck has traded in Beantown and gangsters for Tehran and the Revolutionary Guard. Based on a true story, the hostage rescue thriller tells BEN AFFLECK: "The big appeal for me was that it didn't fit neatly into any one genre or type of movie. It was an unusual hybrid, with comedy mixed in with all the suspense and the CIA spy story, along with a kind of humanistic feel about storytelling. And the over-arching element that makes it all so fas- cinating is that it's true." POST: You shot this in Istanbul, Los Angeles, and Washington, DC. Were you happy to move away from the Boston setting of your other films? AFFLECK: "I was. I never meant to pursue 'Boston filmmaking,' or Boston as my natural go-to setting. I ended up with the films I did because the themes and topics interested me, and they just happened to be set there. The city was also like a character in them. But I realized after The Town that if I didn't do a movie set someplace else, I ran the risk of being pigeonholed — even if only in my own was the Hollywood satire or scenes in Iran or DC — it'd all feel like part of the real world." POST: This was your first time working with DP Rodrigo Prieto, who shot Brokeback Moun- tain and Babel. What did he bring to the mix? AFFLECK: "One of the reasons I wanted to work with him was because I'm such a huge fan of his work with Mexican director Alejandro González Iñárritu. Films like Babel are some of the most realistic-feeling films I've ever seen, while being also incredibly compel- ling. So I was hoping to get some of that magic touch, that instinct for honesty in-cinema. "He's a wonderful hand-held operator. He made my film better, he made wonderful choices, and he's just so gifted. Being the director, you get to take the credit for the film, but anyone in this business knows it's really a compilation of many people's work and a truly collaborative affair." POST: Did you shoot film or digital, and what guided your choice? Ben Affleck, who owns his own Avid: "In post, you're in the cool, dark editing room, calm and focused." the tale of six Americans who escaped the 1979 takeover of their embassy, hid in the home of the Canadian ambassador, and who were eventually smuggled out of the country in plain sight — posing as members of a Cana- dian movie crew scouting Iran for a schlocky sci-fi movie titled Argo, all part of a covert CIA operation. Part period drama, part political thriller, part spy story, the result is already get- ting its director strong Oscar buzz. Here, in an exclusive Post interview, Affleck talks about making the film, which he also co- produced with George Clooney's company, and his love of post and editing. POST: How would you describe this movie, and what sort of film did you set out to make? 12 Post฀•฀November฀2012฀ mind. This presented a chance to really step outside all that — and I'd studied the Middle East at college, so I was always interested in that part of the world. And this had multiple tones and foreign locations, so it was a nice stretch for me." 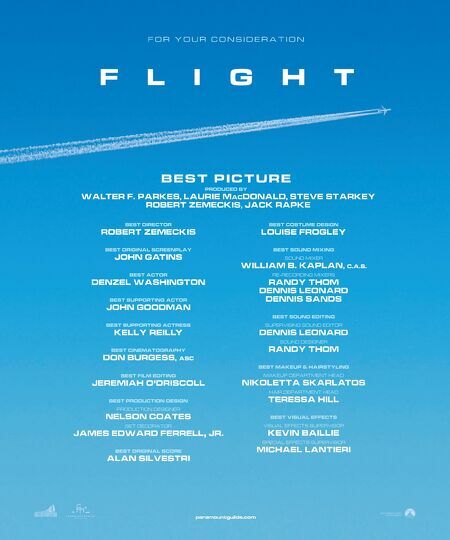 POST: What were the biggest challenges of making such an ambitious film? AFFLECK: "Directorially, it was all the differ- ent tones that needed to be reconciled and made to feel like part of one larger whole film. That process was very daunting, and I continued to wrestle with it well into production. Ulti- mately, I found that it didn't take any great direc- torial magic tricks as much as just good acting. If the acting was real and consistent — whether it www.postmagazine.com AFFLECK: "We shot film. There wasn't any real talk of going digital. I don't like digital. Though we used a digital camera for a few sequences in Turkey, where there was very low light and we couldn't use lights in these historical sites. But even that small bit of the movie... I don't like how it looks. I will shoot film until there's no more left." POST: Where did you do the post? How long was the process? AFFLECK: "It was all done in LA over about six months. We rented an office above my dentist's office in Brentwood for editing — the same place we used for The Town. It's close to my house, so I was able to work on the cut fairly easily. Then all the mixing and scoring was done on the lot at Warners, with a bit of scoring at Capitol Records, which was pretty cool. Then we did the DI at EFilm. Last time I used Company 3."